How to Stabilize a Video? Though nowadays the camera anti-shake technology is gradually mature, it can’t ensure that you shoot a video with all its frames stable. Especially when you record your daily exercise routine, take the scenery when you are on an airplane, or in any other scenarios when you can’t use a tripod. In order to solve such kind of video shake problem, many video editors have developed the relative functions to help stabilize shaky video. Apart from a professional camera, you may also need video editing software with the stabilizing function to optimize your video. This article will introduce both easy-to-use and professional video editors, together with the step-by-step instructions to stabilize videos with these tools to you. If you want to stabilize a shaky video, then upload it to your YouTube channel, you can just use YouTube’s online editing tool. Apparently, this is the most convenient way for you to do so. Though YouTube’s online editing tool is surely not as powerful as a professional video editor, some basic editing functions of it are worth us taking attention to. Below are the steps for you to stabilize shaky video with YouTube editing tool. Upload a video to YouTube as you usually do, but remember to set it as private before you finish your editing. Click on “Video manager” after uploading. 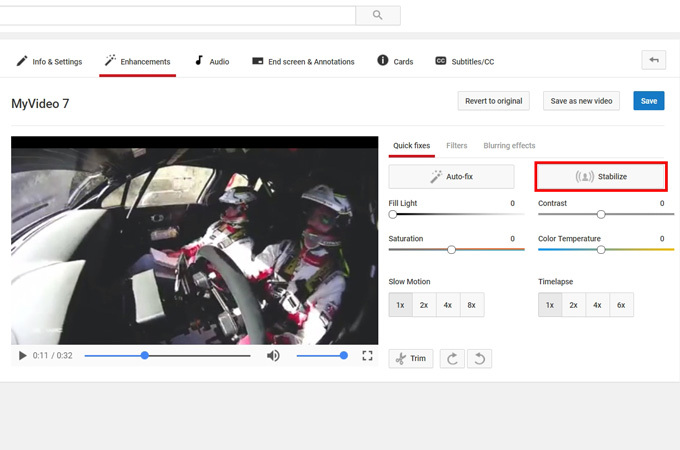 Choose “Enhancements” to edit the video. 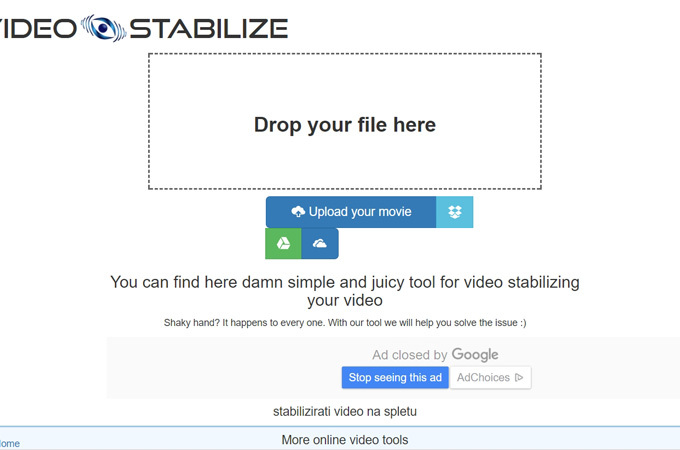 Click on “Stabilize” to stabilize the video. Click on “Save” to save the editing. In case that you want to further edit your video, not just stabilize it, you may need a video editing app instead of the YouTube online tool to do it. Therefore, we pick up some video editors for you to make a choice. This is a free online tool for users to stabilize shaky videos. However, the uploading process will waste your time if your internet speed is not good. In spite of this, this stabilizer is easy-to-use and worth you to have a try. Below are the instructions for you to stabilize shaky video. Upload a video waiting for stabilizing. Click on “Transform video”, and wait for it to detect shakes in your video. Click on “Download result” to save the video. Adobe has produced some classical software. After Effects is one of them. It functions both as a basic video editor and as a professional video editor. In fact, Adobe After Effects is not easy-to-use for those who don’t have the editing experience before. Thus we would recommend this video editor to seasoned users who want to stabilize a video and at the same time, delicately editing it to get an awesome result. Here are the simple steps of how to stabilize a video with it. Import the video footage to the project. Drag the video footage in the project onto the “Create A New Composition” button. Click on “Make Movie” button under “Composition” tab to save the video. Windows Movie Maker is the cornerstone in the field of video editing. This video editor is designed for beginners or amateurs, so everyone can use it to edit a satisfied video. Actually, it also allows users to stabilize videos, and the operation is so simple to be learned. 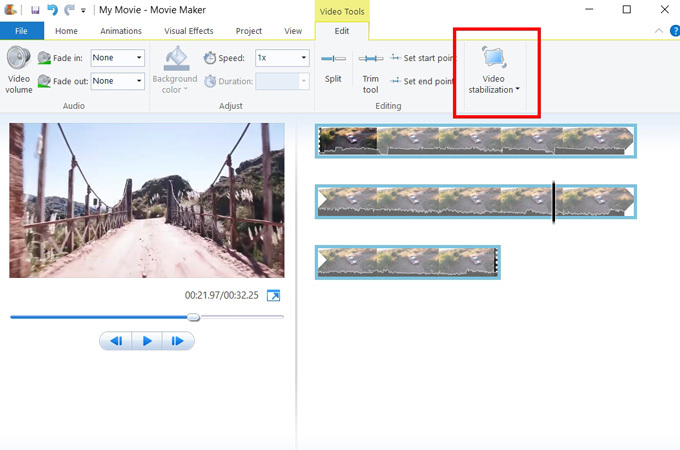 The steps of how to stabilize shaky video with Windows Movie Maker are listed for you. Open the software and import a video file. Click on “Edit” button in the toolbar. Click on “Video stabilization”, and choose “Anti-shake” to stabilize the video. Click on “Save project” to save the result. YouTube editing software, Video Stabilize, and Windows Movie Maker are all great options for you if you just want to do the basic editing. But if you are looking for a professional video editor to edit your video in detail, then you can choose Adobe After Effects. All in all, the above software and instructions deserve you trying out. We hope you can find the suitable way to stabilize shaky video.